We receive emails nearly every day from people asking how to sell antiques or vintage items. Sometimes they have inherited antiques, sometimes they are just downsizing or have another reason to let go of a piece of furniture or other antique that they have enjoyed for years. Either way, they aren’t sure where to start. So here is our advice on how to sell antiques. 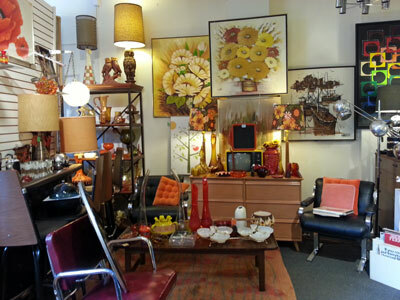 A great place to begin searching for values of antique or vintage items is Worthpoint.com. 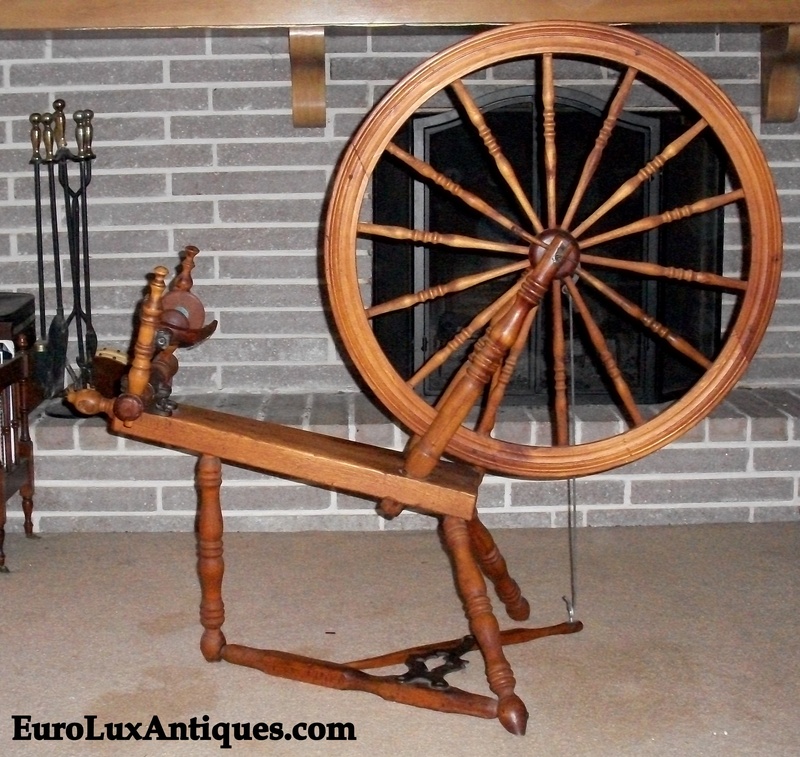 Of course, you can also explore sites where people sell antiques online, like Ebay. But Ebay only shows the last 30 to 45 days of data whereas Worthpoint has a huge database. It stores many years’ worth of information from ecommerce venues like Ebay and GoAntiques.com as well as other important auction houses. Worthpoint is definitely worth the price for unlimited access for 30 days if you have specialty items or many things to look up. If you want to try it out first, Worthpoint offers a free trial period for a limited number of searches. You can also send a description and photos of your item to a “Worthologist” to get an expert online appraisal for a fee of $29.99, which is very economical. I suggest the Worthpoint.com appraisal service because you’re unlikely to find an antiques dealer to give you a free appraisal. Dealers receive so many requests for free appraisals and although they are lovely folk, if they spent all day helping people with advice they would never have time to run their own businesses! So if you want to sell antiques but don’t know how to price them and don’t have time to research values, it’s well worth paying for the service of an expert appraiser. If you are handling the estate of a relative, you may want to hire a licensed personal property appraiser in your area. 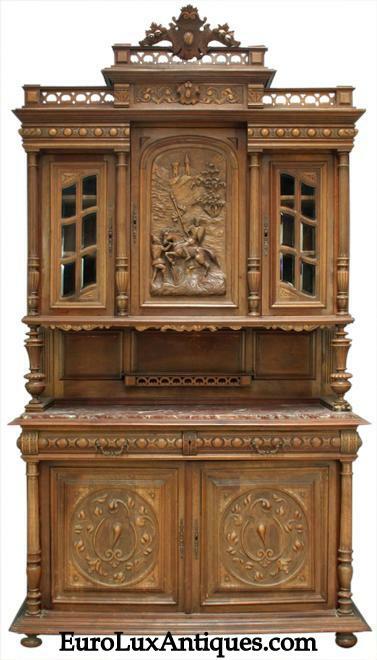 Or you can contact a local auction house to help you determine the value of items. 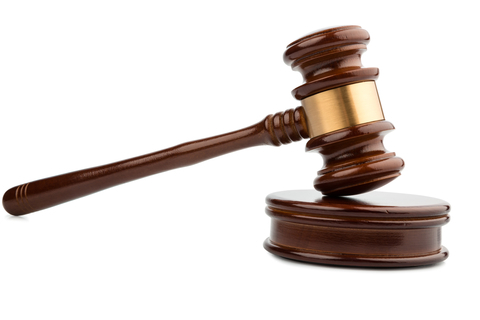 If you have rare or especially valuable antiques, you might want to find a specialty auction house. For instance, you would go to Theriaults for dolls. 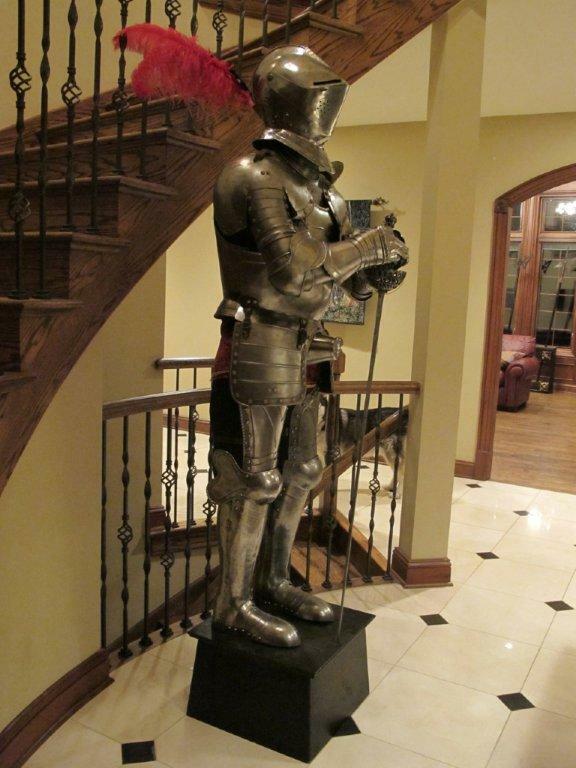 Obviously you can sell antiques through a local or specialty auction house. Or you can list things for sale on Ebay or GoAntiques or Etsy. You can even post an ad for free through your local Craigslist. 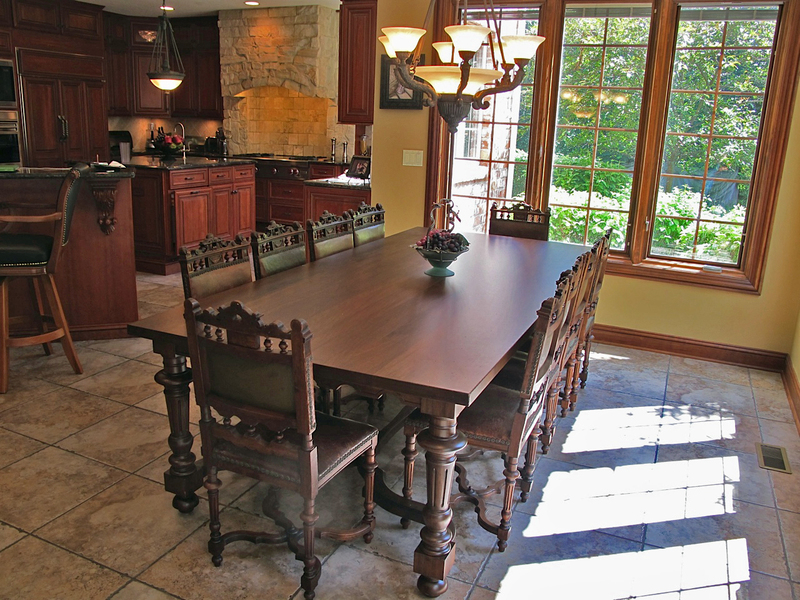 You might also contact interior designers in your area to see if they could place a piece of antique or vintage furniture with one of their clients. 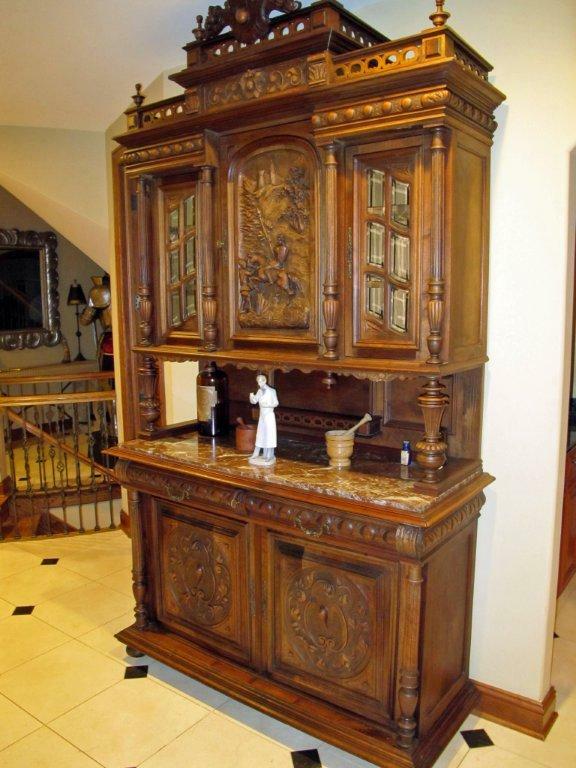 You could also contact antique dealers in your area to see if they are interested in purchasing a piece outright. In this case, realize you will need to accept a wholesale price, not a retail price. 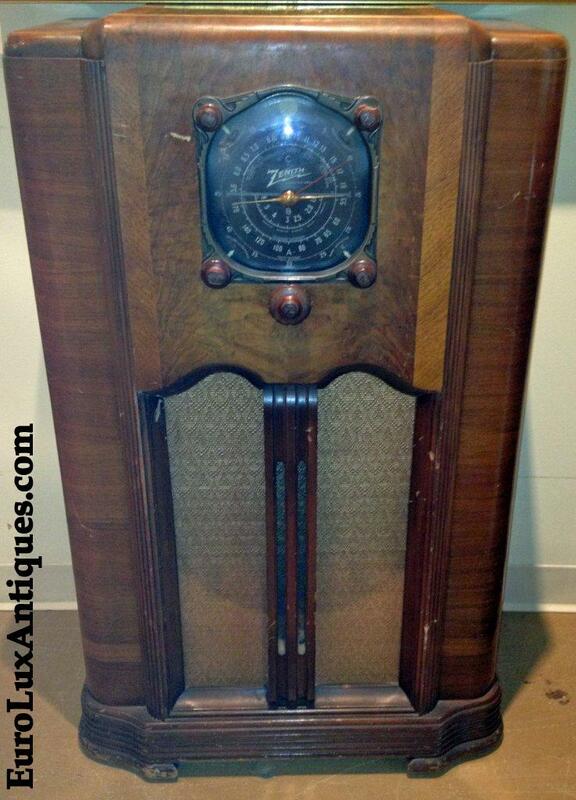 Dealers have large overheads and sometimes they have to keep an antique in stock for a long time before finding a retail customer. The upside is that by selling to a dealer you’ll receive payment more quickly and don’t have to do all the selling yourself. However, many antique dealers may only be interested in taking a piece on consignment. This is assuming that it fits with their inventory and they have the space in their gallery. Most dealers would expect to charge a 30 – 50% consignment fee, and you would be responsible for the transportation of the piece to the dealer’s gallery. 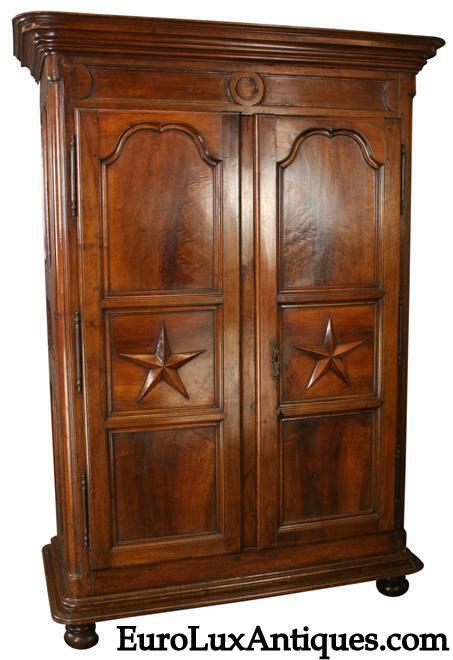 Keep in mind that it can be quite expensive to ship a piece of antique furniture safely. 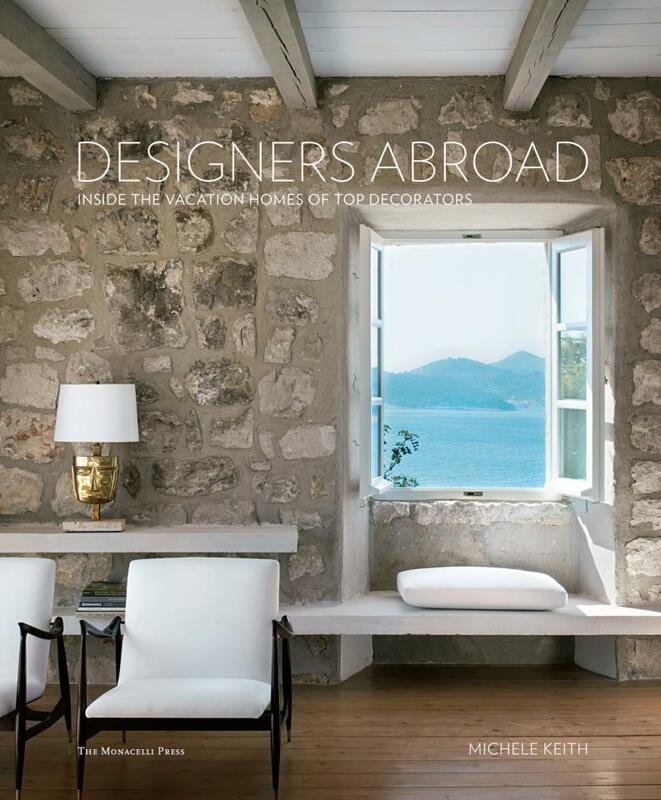 That shipping cost will come out of your pocket if you contact a dealer outside your geographical area. 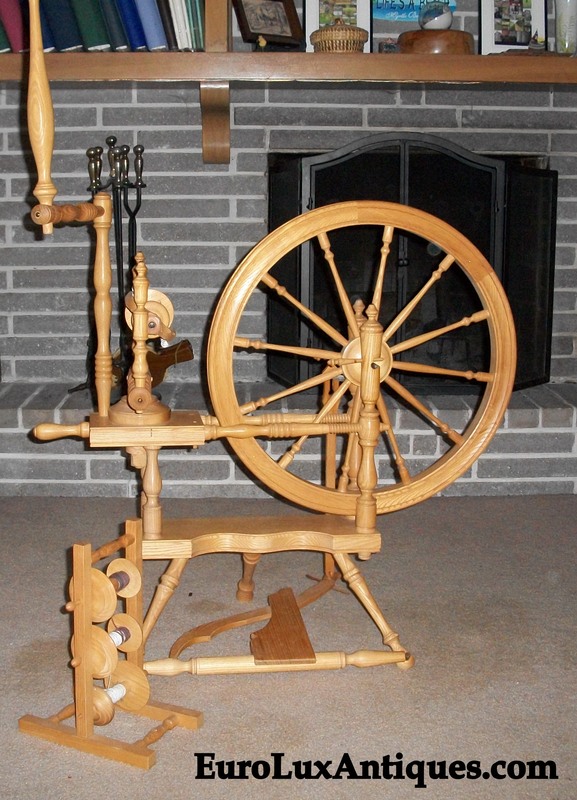 You’re usually better off contacting antique dealers in your closest large city. If you opt to sell antiques online through one of the ecommerce sites, you’ll need to write good and detailed descriptions. Even if you don’t know much about antiques, make a note of any makers’ marks or hallmarks and give exact measurements. Also take good, clear photographs from many angles. A picture speaks a thousand words! 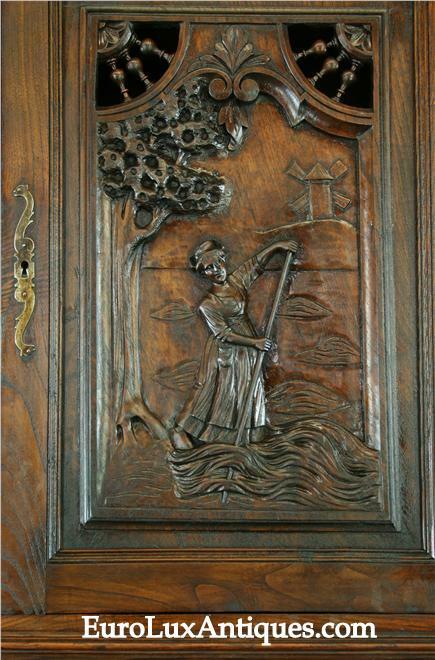 Include close-up shots of any decorative details and maker marks, and ideally show the insides of cabinets or drawers. 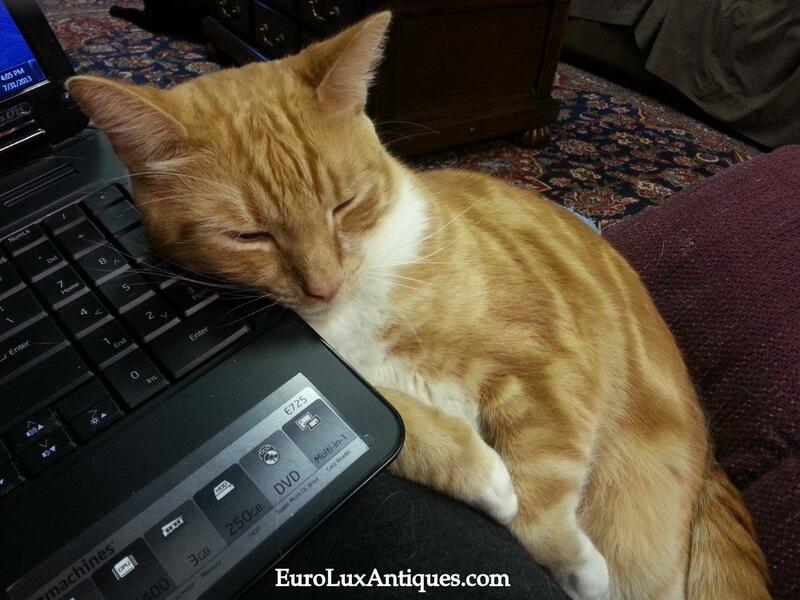 At EuroLuxAntiques.com, we tend to provide lots of images when we sell antiques so buyers can see everything as clearly as they would inspecting the item in person. Then they are confident about making a purchase, or they can ask for more details if uncertain. Finally, be honest about any damage or wear. People expect antique items to show a little wear – that is part of their history and unique charm and it proves their authenticity! But nobody wants any nasty surprises when the item arrives. The condition of an antique is a big factor in assessing its worth, as two similar pieces can sell for vastly different prices if one is in mint condition and the other rather more well-loved! For this reason, also be honest about the condition with appraisers if you get an online appraisal, otherwise the expert can’t give you the best advice. If you have other suggestions for people wondering how to sell antiques or vintage items they own, please tell us in the comments box below! 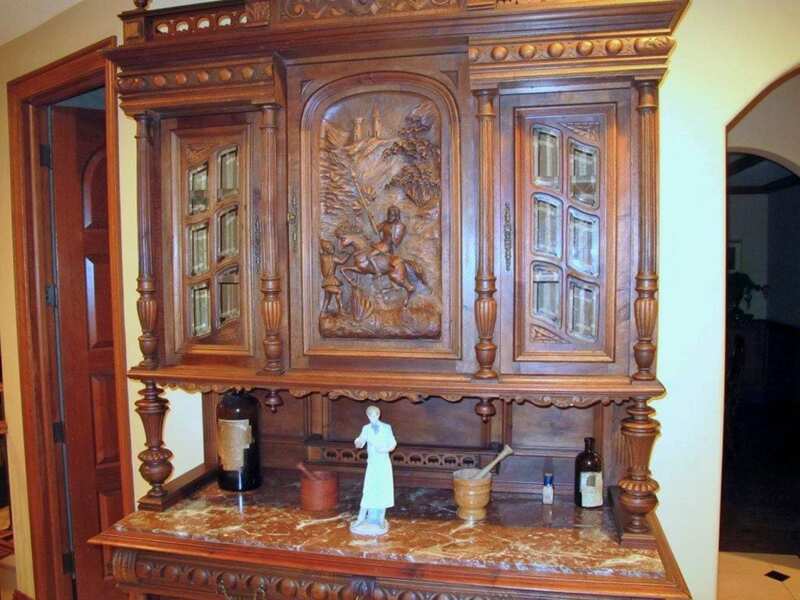 This entry was posted in Antique Furniture, Is My Furniture Antique? 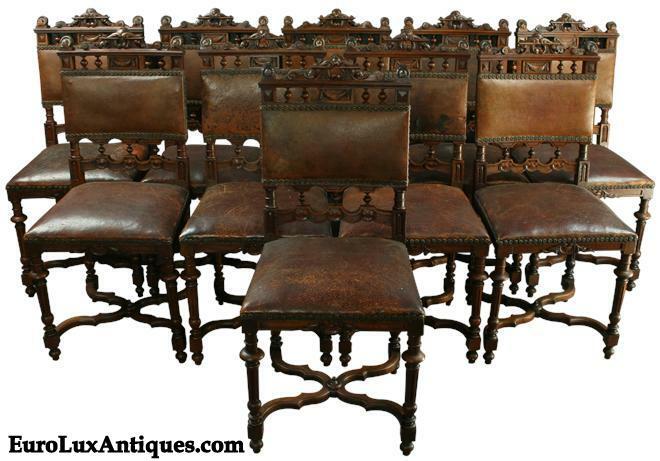 and tagged Antique Furniture, antiques, Antiques Shopping, online antiques, Sell antiques, Vintage Furniture on August 21, 2013 by admin. 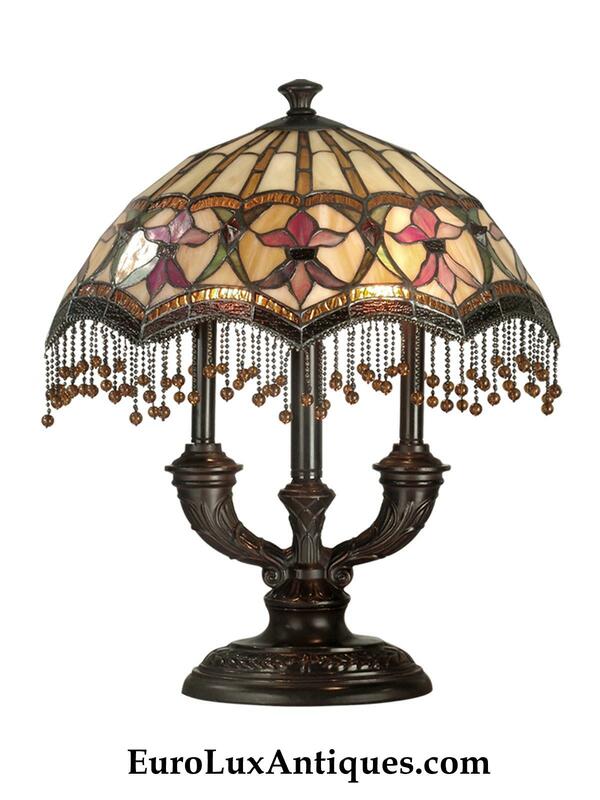 EuroLuxAntiques.com has carried Dale Tiffany lamps, chandeliers, and other light fixtures since summer 2012. These stunning hand-made glass lights often replicate the original stained glass designs of Louis Comfort Tiffany lamps. The creative process behind Dale Tiffany lamps is a wonder to behold so I was delighted to see this video showing how the artisans hand-craft each piece. Eye candy alert! You’ll see some gorgeous lamps in this video. 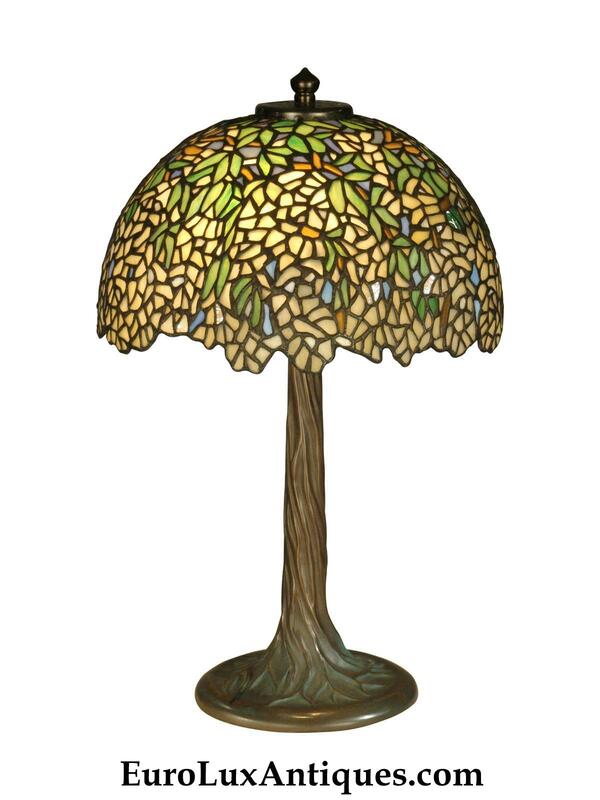 All Dale Tiffany lamps are unique pieces. The craftsmanship starts by creating the art glass. True art glass is made by hand-blending a palette of molten glass tones to conjure up unique colors. Then the glass is hand-cut and each piece is individually edged with copper foil. This technique was developed by Louis Comfort Tiffany more than a century ago for his famously ornate glass mosaics. Finally, the artisans hand-assemble the pieces of glass into the mosaic design of the shade. The mosaic is soldered together and given a superbly authentic antique finish. Metal filigree might be added to accent details such as dragonfly wings. Hundreds of pieces of glass are used in the designs, and some shades feature more than 1,000 individual glass segments. 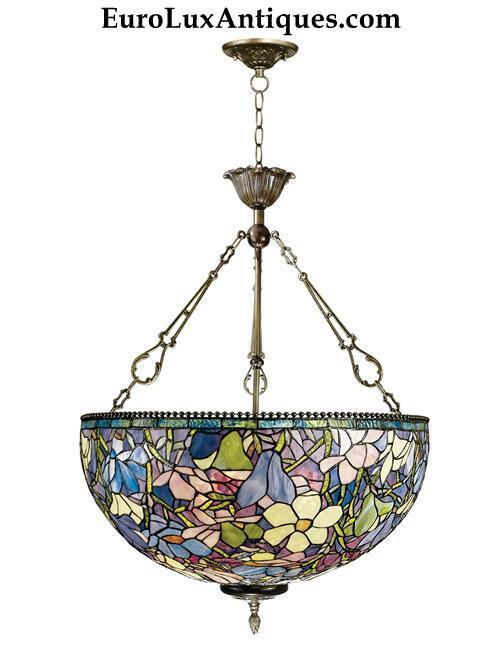 You can see the full selection of Dale Tiffany lighting in our online gallery or click on any of the pictures for more details. 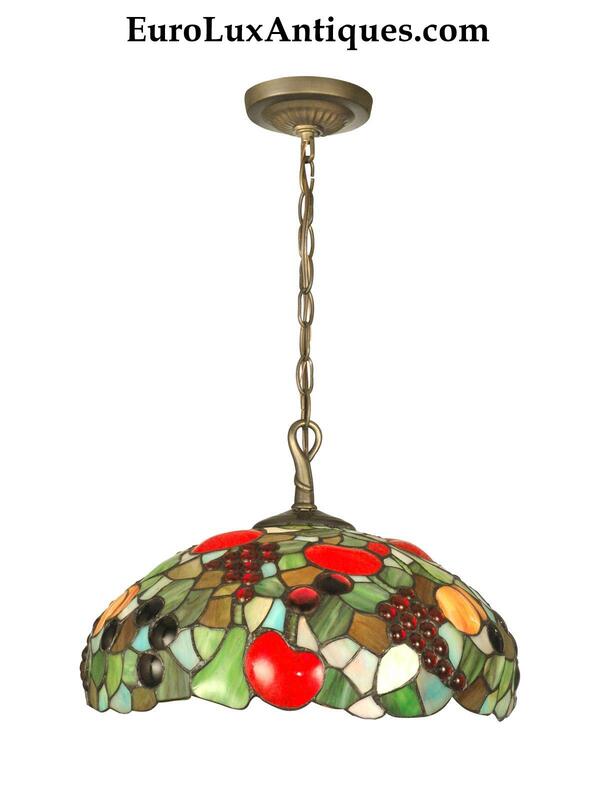 In addition to reproductions of original antique Tiffany lamps, Dale Tiffany has created some designs inspired by Tiffany style and traditional techniques, but reflecting contemporary tastes in home decor. Greg and I are very selective about the reproduction product lines we offer to our customers. 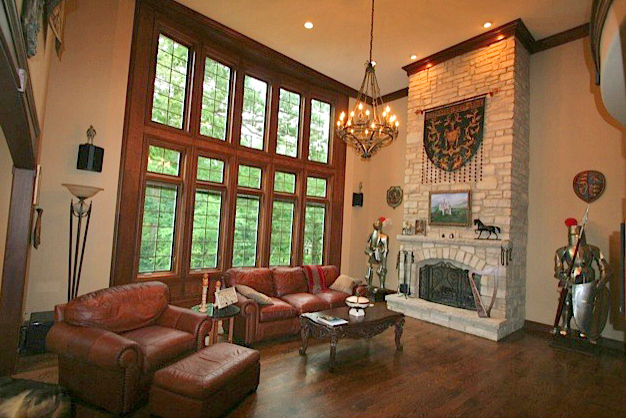 The high quality and skilled craftsmanship of Dale Tiffany lamps and chandeliers meet our exacting standards! We know our clients want the benefit of beautiful heirloom-quality lighting at a much lower price than the original antiques. Louis C. Tiffany broke new ground in designing with glass, but his designs were limited to the wealthy. Not any longer! It’s wonderful to see the tradition of Tiffany lamps continue as Dale Tiffany creates the antiques of tomorrow. 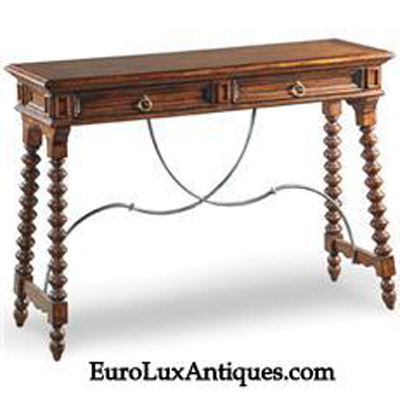 This entry was posted in Learn History & Styles, Vintage Lighting & Chandeliers and tagged chandeliers, Dale Tiffany, EuroLux Antiques, high quality reproduction furniture, home decor, home decor accessories, lighting, Tiffany chandelier, Tiffany lamps on August 16, 2013 by admin. 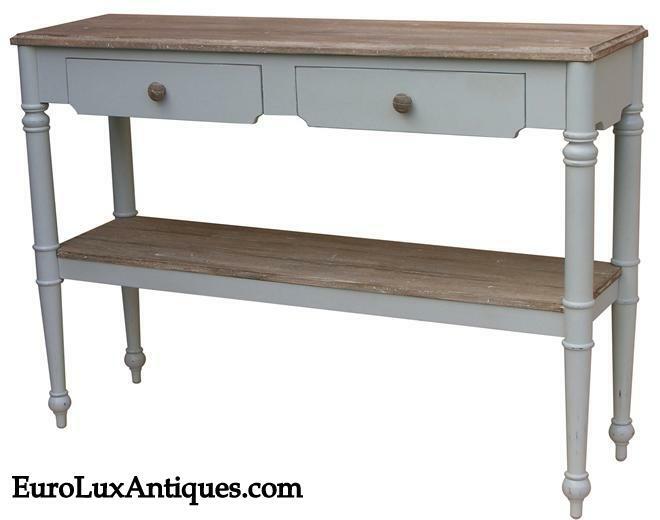 A gorgeous console table makes a stylish and very useful addition to any home. 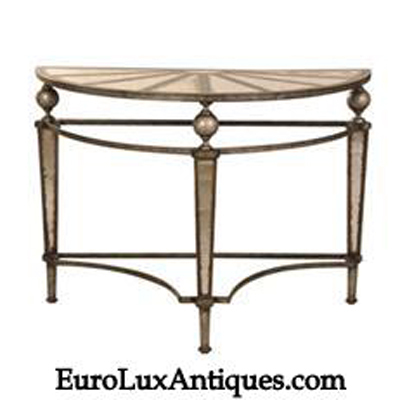 We have a large range of console tables at EuroLuxAntiques.com and sometimes customers are spoiled for choice! 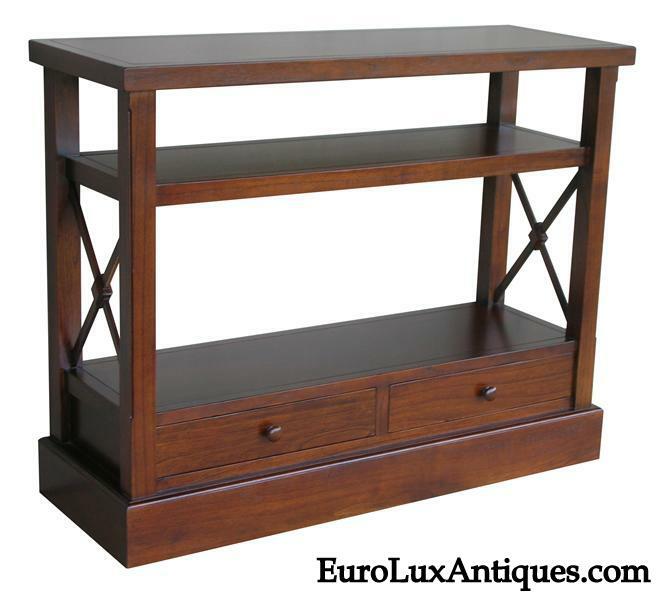 Elizabeth L. in San Francisco, CA, told me she was trying to choose between three different console tables for her long, narrow hallway, but was having a hard time picking which was the perfect one. I suggested printing out photos of each table and hanging them in the hall above the space where the table would live. That way she could walk by the choices each time she passed through the hallway, with the hope that one would jump out at her in time. 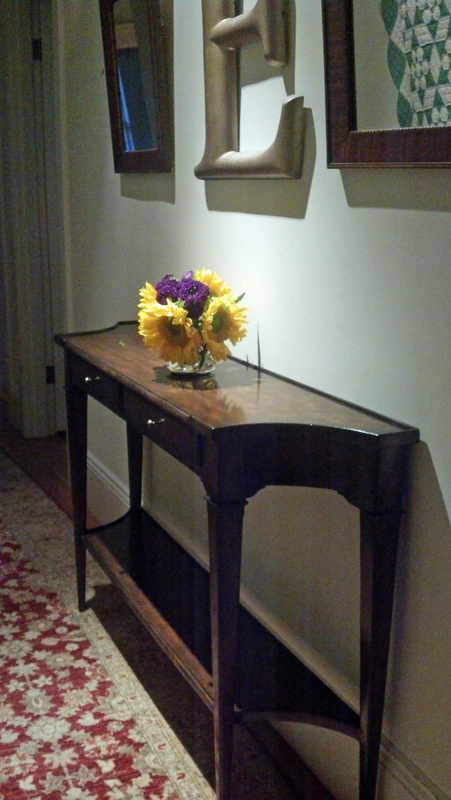 Elizabeth called in the help of a friend, who immediately pointed out this Woodbridge Marseille Console Table as the clear winner. Elizabeth admired her friend’s taste in design so she went with that choice and is very pleased! 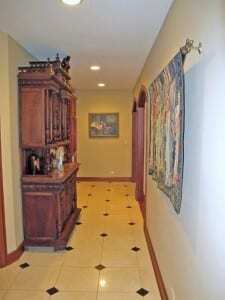 Doesn’t it look fantastic in her hallway? 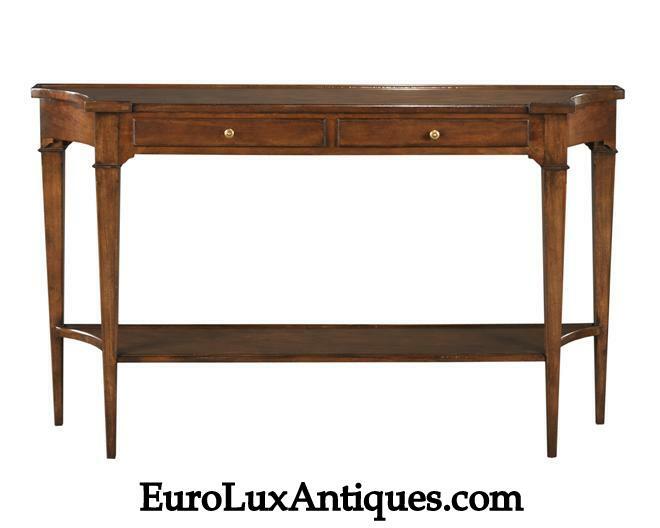 The elegant reproduction console table in a traditional French style is a generous 54 inches long, but at a slender 12 inches deep it’s a perfect fit for the narrow space. The pretty posy of flowers pops against the rich cherry veneer of the solid wood table. The table is hand-waxed and distressed to give the illusion of age and the C-curved sides and tapered legs add to the streamlined silhouette so the table doesn’t overwhelm the space. I love the way Elizabeth created a striking vignette with the mirror and art above the console table, flanking a vintage style gilded letter E! Console tables are very flexible pieces of furniture and can be used in so many ways. 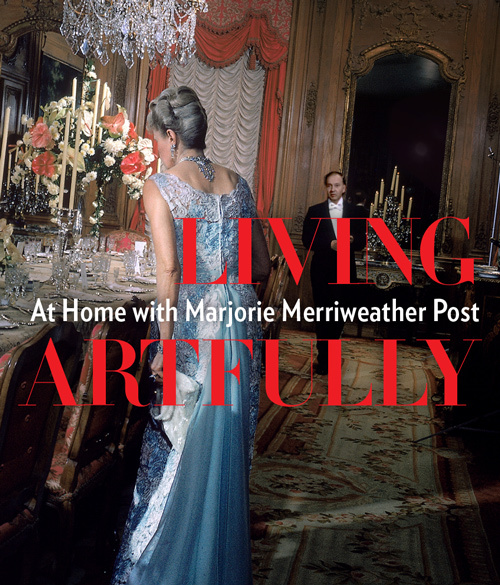 They make the maximum use of a narrow space like Elizabeth’s hallway, but can also be used as an accent table in a larger room, providing space to display your antiques and collectibles, framed family photos, or a beautiful table lamp. A console table can also serve to visually separate and define different areas of a open-plan living area if you place it at a right angle to the wall. A console table can even double-up as a dressing table in a small scale bedroom, or provide extra space to stack guest towels and store necessities in a compact bathroom. While most console tables are by their very nature rectangular, a demi lune or half moon curved table can look very charming and create interesting visual texture by breaking up a linear space. This entry was posted in Client Spotlight and tagged console table, decor, interior design, reproduction furniture, Woodbridge Furniture Company on August 8, 2013 by admin. 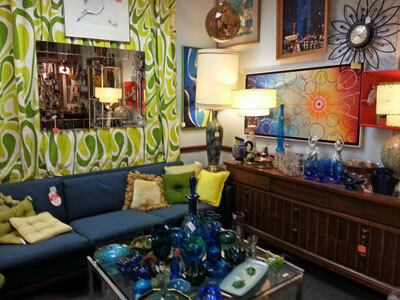 Road Trip to Columbus, Ohio: Vintage Life at Flower Child! Summer road trips are awesome. For me, they bring back that wonderful and exciting feeling of the last day of school – jumping on your bike, heading home with the sun on your face, and a huge expanse of summer ahead of you. What adventures would lie in wait around the next corner? Greg and I drove to Columbus, Ohio, to visit his sister and her family this summer and had a great time. 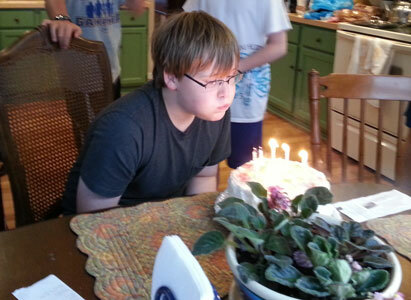 We were there in time to celebrate my nephew’s 12th birthday with a pizza party and red velvet cake. 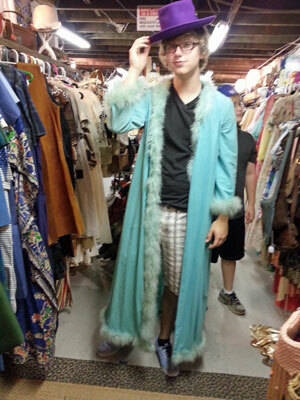 My nephew, M., loves antique and vintage things and is a proud “kid picker” (a great program established by Mike Wolfe of American Pickers to encourage young people to be interested in antiques). 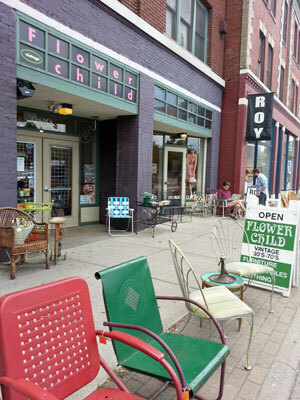 He saves his allowance to hit garage sales every weekend and absolutely loves to explore thrift shops, so I was quite excited when he wanted to take us to his favorite vintage shop in Downtown Columbus, Flower Child. From the first sight of the 1950s metal porch chairs out front, I was smitten. 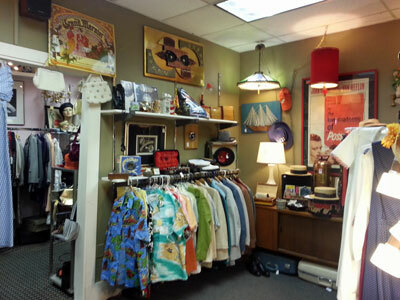 But when I walked inside, I knew I had found 1970s vintage mecca. 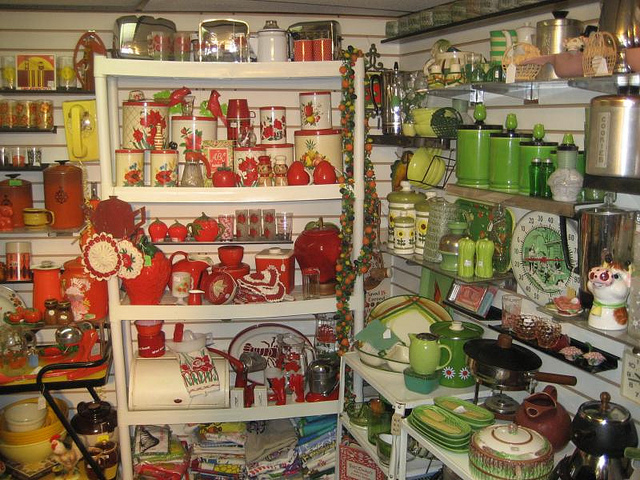 You’ll find a huge accumulation of vintage stuff at Flower Child – furniture, art, housewares, kitchenware, clothes, shoes, and jewelry – I hadn’t see this much 1970s stuff in one place since my own house growing up in the 1970s! But I’m certain we didn’t have that many macrame owls. 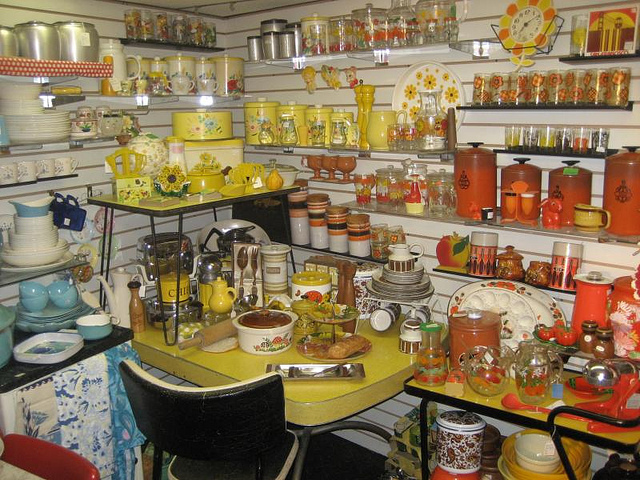 I wanted to buy it all, especially when I found the kitchenware room, but as we still have at least a year to go before we finish our bungalow renovation, I resisted the temptation to begin decorating. I definitely will be back though! And then I found out there were not one, but TWO! 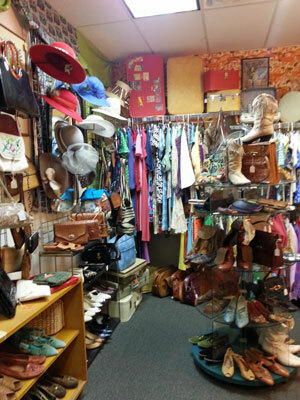 basement areas filled with more vintage clothing – it was overwhelming! S., my 15-year-old nephew, immediately put together a totally fly outfit – complete with purple top hat. And then I saw them – a pair of late 1960s purple platform heels in nearly mint condition – and gasp – they fit! That was it – I had found my summer road trip souvenir. But with which outfit would I wear my dream shoes? I had so much fun picking out this outfit and spending the afternoon browsing through Flower Child with my nephews. It was one of the highlights of my summer road trip. If you love vintage stuff and you’re in the Columbus, Ohio area (there’s also a store in Cleveland), be sure to stop in and admire the world’s largest collection of macrame owls. 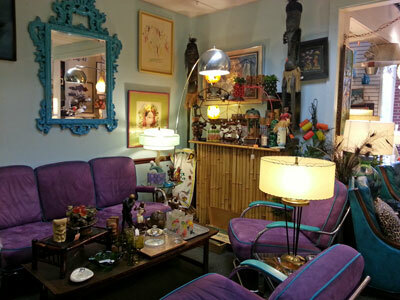 Do you have a favorite vintage/antique shop that is a must-see in your area? Tell me about it! 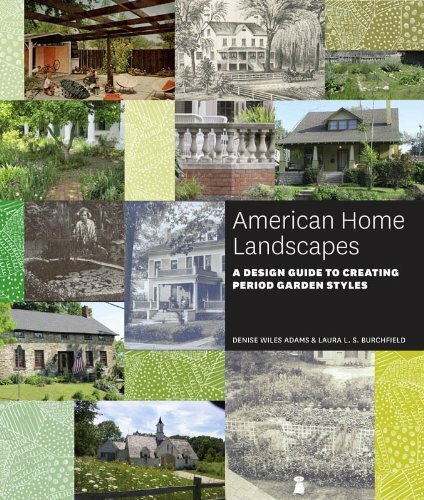 This entry was posted in Home Design Ideas, News and tagged 1960s Purple Shoes, 1970s Vintage, Columbus Ohio, Flower Child, Kid Pickers, Vintage Life on August 1, 2013 by admin.